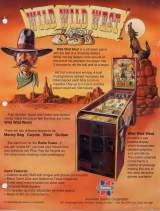 Wild Wild West © 1995 American Sammy Corp.
Wild Wild West is a roll down game with the feel of a Shooting Gallery. While moving targets circle around at the end of the playfield, the player has 3 chances to roll the ball and hit a target. Hit 3 of a kind and win big. A built in progressive jackpot increases the ticket payout each time a coin is inserted. Play up to 3 coins and the player could win 500 tickets! There are 4 different targets to hit : Money Bag, Coyote, Steer, and Outlaw. Watch out for the Rattle Snake... if you get 'snake bit', you lose you tickets from previous roll. Plus, Pop Up Targets on the ramp make shooting more challenging!